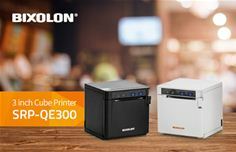 BIXOLON Co., Ltd a leading global mobile, label and POS printer manufacturer today announced the addition of the SRP-QE300 entry-level 3-inch (80mm) Direct Thermal cube Receipt and Ticket printer to its innovative SRP-Q300 series line-up. Supporting USB and Ethernet connectivity, the SRP-QE300 produces print speeds up to 200mm/sec with a print resolution of 180dpi producing high quality texts, graphics, barcodes and QR codes. The rest of the SRP-Q300 series are available with 180dpi or 203dpi (SRP-Q302) print resolution at speeds up to 220mm/sec. USB and LAN connectivity are also standard on SRP-Q300 model plus NFC for Android™ functionality for initial printer setup and configuration with Android smart devices running on Android OS V3.1 or higher. Enabling user convenience throughout the printer setup, the BIXOLON Android Q300 Utility Software application on the Google Store provides exclusive setup compatibility with the SRP-Q300. Bluetooth and WiFi available on the SRP-Q300BK and SRP-Q300WK respectively. Completing the line-up, the SRP-Q300H with BIXOLON’s intelligent B-gate connectivity hub can seamlessly connect to the host tablet device (via Bluetooth communication) while supporting 1 charging port and up to 4 USB peripherals (scanner, cash drawer, customer display, RFID reader, scales, etc). The SRP-Q300H can print receipt or online orders through a native, web and cloud-based mPOS application with B-gate SDK’s (Software Development Kits). Paired with BIXOLON’s mini LCD customer Display (BCD-3000) and a robust steel tablet stand safely securing a 10inch tablet using a locking mechanism and 170° forward-tilting feature to build a complete mPOS solution. For more information, contact us at http://www.bixolon.com/, or follow us on these social channels: Twitter, Facebook and YouTube.